Check out these awesome slides. I wish I had a slide from the top floor of the psychology building to the basement (where I work). This is a great example of play at work. I remember a while back that a photo of Google’s offices in Switzerland had a small (compared to the slides in this photo) slide, and this is the first time I’ve seen workplace slides for adults since that Google-slide. 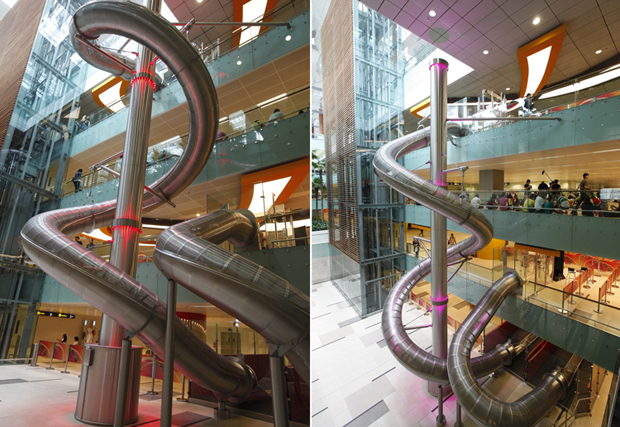 This mega-slide is apparently from Singapore Airport. Any clients in Singapore who want me to do a creativity or play workshop or something similar? I am willing to negotiate the price. Contact me ASAP. This entry was posted in Uncategorized and tagged kreativitet, lek, lek på jobbet, play at work, samuel west, singapore, slides on March 15, 2012 by admin.